Pittsburgh, PA – January 24, 2017 – PetCure Oncology at PVSEC treated its first patient on Tuesday, officially marking the arrival of a new, life-changing cancer treatment for pets in western Pennsylvania. Stereotactic radiosurgery (SRS) has emerged as a standard of care in human oncology over the last few decades, but has only recently become available in veterinary medicine. Less than 20 specialty centers across the country possess the technology and clinical staff to provide SRS to pets. That list that now includes Pittsburgh Veterinary Specialists & Emergency Center (PVSEC), western Pennsylvania’s leading veterinary specialty hospital. The upgrade at PVSEC was made possible by a partnership with national cancer care provider PetCure Oncology, who is now operating the practice’s radiation oncology department. Beau, a 6-year-old labrador retriever, was one of the first Pittsburgh-area pets to receive SRS. The progressive cancer care offered by PetCure Oncology at PVSEC is already making a difference in the lives of pets and their families. Pittsburgh residents Cindy and John Jagielski were devastated when Beau, their six-year-old labrador retriever, was diagnosed with a brain tumor last October. 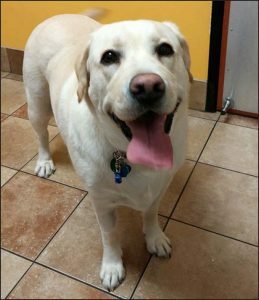 Though SRS was not yet available at PVSEC, the Jagielski’s drove nearly 300 miles for Beau to receive treatment at PetCure Oncology’s Cincinnati location, previously the closest center providing SRS for pets. For the Jagielski’s, the choice was simple. Brain surgery would have been extremely invasive and complex. Conventional radiation therapy would have required approximately 20 treatments over a four-week period, and the Jagielski’s were concerned about potential side effects. SRS, on the other hand, is more effective and efficient than previous forms of radiation therapy because it is delivered with unprecedented precision. That means higher radiation doses can be delivered directly to a tumor without irradiating the healthy anatomy around it. An entire treatment course is delivered in just 1-3 sessions, noninvasively and with minimal side effects. PetCure Oncology at PVSEC is led by Dr. Christine Anderson, a board-certified specialist in both radiation oncology and medical oncology. With the collaboration between PetCure’s national network and PVSEC’s comprehensive veterinary specialists, the level of care afforded to pets with cancer at PVSEC is unrivaled in the region and available in only a handful of markets nationwide. PetCure Oncology at PVSEC is the fifth site in PetCure’s national network, joining locations in Phoenix (AZ), Cincinnati (OH), Milwaukee (WI) and Clifton (NJ). PetCure Oncology is dedicated to providing all pet owners access to comprehensive cancer care that includes SRS. To learn more about PetCure Oncology or SRS, visit PetCureOncology.com or call (773) 850-3400. PVSEC, the leading specialty animal hospital in western Pennsylvania, has been providing exceptional 24/7 specialty and emergency care and has been a leader in patient care innovation for more than two decades. With 15 clinical areas of expertise, PVSEC is the most comprehensive multi-specialty veterinary center in the region. PVSEC is now the only veterinary practice within 250 miles that offers comprehensive cancer care with SRS.